(NaturalNews) Allergic rhinitis, internal nasal mucous membrane inflammation, plagues many during seasons that vary according to location. Hay fever can kick in almost any time in some areas. It often exceeds the parameters of nasal inflammation and intense sneezing by irritating the eyes and sometimes the entire nervous system while creating a feverish feeling. It can be quite severe. The commonly prescribed and over-the-counter (OTC) allergy pharmaceuticals only make one feel dull and groggy or worse with the effort at simply masking symptoms. The underlying dynamic of the immune system's rejecting a normally benign pollen with chronic inflammation remains a mystery to mainstream medicine. Austin, TX, is considered by some as "allergy central". Since hay fever, known as "Cedar fever" here in Austin, is so prevalent, there's no problem finding several natural herbal and homeopathy-based medicinal solutions for your first bout of Cedar fever. However, these safer solutions are temporary and have to be repeated often. Apparently, Traditional Chinese Medicine (TCM) offers seasonal and permanent allergy solutions with acupuncture. Looking through a list of TCM clinics and acupuncture schools in Austin, one finds reviews of how their allergies were cured completely to never return after a few acupuncture sessions. One woman spoke of how she had reactions so bad she felt like "ripping her eyes out," until she tried acupuncture. Now after a few sessions, no more intense allergic attacks. Of course, this is all anecdotal. So along comes medical science to cautiously confirm what real life people report. Keep in mind that several European countries still openly use herbal remedies such as butterbur and others for allergies. Nevertheless, the Berlin study "Acupuncture in patients with allergic rhinitis: a pragmatic randomized trial," was conducted among 981 allergic rhinitis sufferers. Of the 981, 487 were randomly assigned to acupuncture and 494 to control. They could all avail themselves to established medical treatments during the three month period when the 487 allergy sufferers received 15 acupuncture treatments. After those three months, their Rhinitis Quality of Life Questionnaire (RQLQ) was three times higher than the control group. Quality of life scoring was also higher among the acupuncture group than the control group, although the scores were slightly less with the six month follow-up testing. Another much larger group of people receiving acupuncture for allergies on their own without being specifically assigned as part of this randomized trial was surveyed as part of an overall epidemiological study with similar results. Conclusion: "The results of this trial suggests that treating patients with allergic rhinitis in routine care with additional acupuncture leads to clinically relevant and persistent benefits." TCM doesn't consider allergic reactions to normally benign elements as mysterious. They pursue the underlying causes with diet, herbs, and acupuncture. Since TCM's foundational premises involve chi or Qi energies, they look at dealing with esoteric properties such as wind and dampness. They can also determine chi deficiencies connected to different organs. With allergies, lung and spleen chi deficiencies are most common. 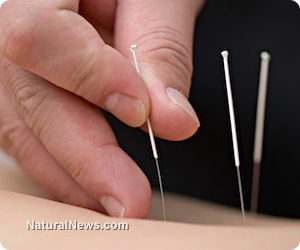 Herbs are available for these as an adjunct to acupuncture, which alone usually delivers more immediate results. Complete allergy remissions can be achieved with the latest acupuncture development known as Nambudripad's Allergy Elimination Technique (NAET). Dr. Devi Nambudripad developed the technique of first determining the specific allergens, then using acupuncture techniques to relieve their effects while exposing the patients to them. This technique reprograms the body to accept those allergens without the immune system's over reacting to produce hay fever or other allergic reactions. Often the effect is long term, virtually vanishing one's allergy.